Nowadays Brib provides most of it's services through other charities that it supports by providing a site for their services and through the provision of grants which are awarded according to the grants policy. The main charities supported are QAC and Focus. Queen Alexandra College (QAC) is a national, residential College that supports a diverse range of abilities and needs based in Birmingham. We offer education for young people aged 16-25 years as well as employment-focused and supported living programmes. The College welcomes students from all over the country – as well as many who are local to us and has been at its current location since 1903. Our original purpose was to provide education for people who were blind or visually impaired. 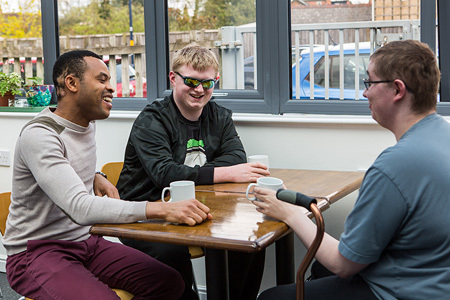 Today, in addition to supporting people who have a visual impairment, we offer support and guidance for students on the autistic spectrum (including individuals with Asperger’s syndrome), those with moderate to severe learning difficulties, students with physical disabilities and those with other needs. Ultimately, we have a great mix of students which adds to the wonderful atmosphere here in College. Class sizes are small and support levels high. At QAC learning is planned around individual needs, interests and ambitions. Our curriculum covers a wide range of programmes including entry level courses (Preparation for Life) and a range of vocational qualifications. A supported internship study programme could also be followed, which involves spending the majority of time with an employer in a real job role. We have a dedicated Employment Pathways curriculum. The College has a team of specialists on site who are able to support students, including a Visual Impairment Training Officer, Occupational Therapy and Sensory Support, Speech and Language Therapists, a Dyslexia Tutor, Healthcare Professionals, Counsellors, Mentors, a Braille Tutor, Rehabilitation and Travel Training Officers and a Personal and Sexual Health Education (PSHE) Lead. Enrichment programmes enhance the curriculum and help to develop self-esteem, confidence and independence. 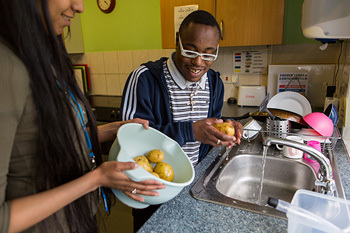 Our residential provision develops essential skills for personal development such as independent living and social skills. Facilities include new buildings with the latest technology, a fitness centre, state-of-the-art sports hall, sports field, sensory room, onsite travel training area, library and student centre. QAC Enterprises consists of a wide range of businesses that raise money for the College and provide excellent work opportunities for students. All Formats transcription services provide a specialist service transcribing documents into a number of alternative formats suitable for people with a visual impairment. QAC is also the UK distributor of Revolution Advantage Carbon Fibre canes – used and acclaimed worldwide. These canes are lighter in weight and more durable than traditional aluminium canes. The College is the organiser of Sight Village – the premier event for blind and partially sighted people, bringing together leading providers of products and services all under one roof. It allows visitors the opportunity to compare products side by side. Focus Birmingham is a specialist charity providing expert support, advice and information to anyone in the Birmingham area affected by sight loss or other disabilities as well as enabling them to lead independent and fulfulling lives in an inclusive society. The Low Vision unit provides a range of services to enable people to use whatever vision they have to the greatest potential. The services extend beyond the abvious (prescriptions for spectacles, the provision of aids and so forth) to include rehabilitation and emotional support, offering a joined-up appraoch to meet an individual's particular needs. The Community Services Team offers a vital source of support and information including a dedicated telephone helpline, community workers offering one-to-one support, visiting services, an information area at Birmingham Midland Eye Centre,"Eye-Conatct" a course dealing with sight loss and eye sight deterioration, social groups and clubs, holidays and community events. The day services team work with adults from age 19 updwards to deliver stimulating programmes of activities which are tailored to the needs of the individual. These are based at the Harbourne site and can include trips etc. They specialist in working with people with visual impairment and other complex needs and provide appropriate support so that each person can achieve their full potential. Both QAC and Focus provide supported living services. Each aims to provide care and support to allow residents to live as independently as possible and where possible to build on these independence skills. Focus Birmingham currently provides a supported living scheme consisting of 14 one-bedroom apartments with Bromford Housing (Millward Place) in Kings Norton, Birmingham. The supported living scheme provides 24 hour care and support to adults who have a visual impairment. QAC provides supported living in a number of shared houses around the Harborne area for those with visual impairment or other disabilities. Primarily used by ex-students this scheme is also available to others. Care is taken to ensure that there is a good match with the individuals living together and support workers provide care as required.